I'm writing this article from the approach of a commercial ecclesiastical carver; applying the rules and procedures taught during my apprenticeship and adhered to by other traditional carvers for centuries. In the past, nearly all artisans and artists had workshops that needed to be efficient in the task of creativity; they had to be commercially motivated to sustain their occupation along with instructing assistants. I may be a little controversial and upset some carvers with these techniques, but you can always ignore advice if you wish and establish your own approach; that's not a problem. All I ask is that you relax and continue to enjoy your carving. Unfortunately, earning a regular income with your hands in any profession requires an efficient approach. I would like to invite you to see the practical approaches to woodcarving that I hope will be of interest and, if applied, may help you to appreciate their advantages. 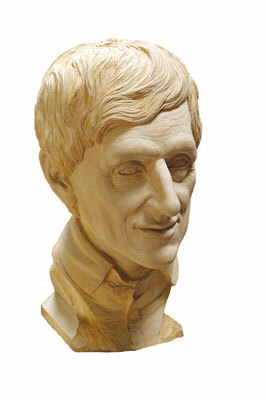 The photographs accompanying this article illustrate a portrait bust of Cardinal John Henry Newman (1801-1890). 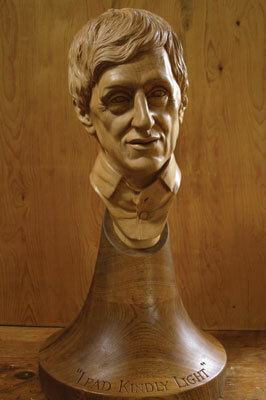 The bust was commissioned and executed during 2011 and carved in lime with a sweet chestnut base. The photograph above displays the preparation before carving commences. The wood is fixed on the carver's post after being bandsawed slightly larger than is required on three sides only - not the back! All the relevant information and photographs of the subject are fixed on a board so they are easy to scan. The plasticine model of the subject helps considerably with measurements and is a visual aid. Now all I have to do is take away the wood that I do not need. One of the golden rules when carving, whether in wood or stone, is to never cut behind any feature until you are totally satisfied with the image facing you. This can be frustrating and demands patience but anyone deciding to work all around a piece or behind features in a relief panel will very quickly be scratching their heads - whilst removing splinters from their fingertips! - and agitating over removed wood that is now very much required. For thousands of years, carvers of varying traditions and cultures have followed the principle of working from only one direction or viewpoint, usually the front. 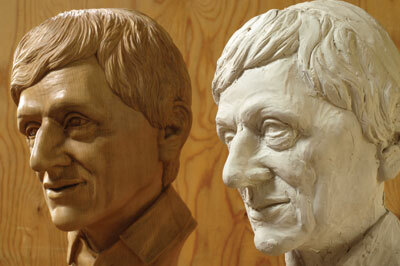 Even great abstract carvers follow this approach. This principle allows you to overcome most of the errors we all make. It saves time, and in my situation time is the labour cost that can prove the most expensive. The only downside is that you will require a little more timber for your project to allow for adjustments to eliminate errors. The cost of extra materials totally outweighs the time spent re-cutting the piece. 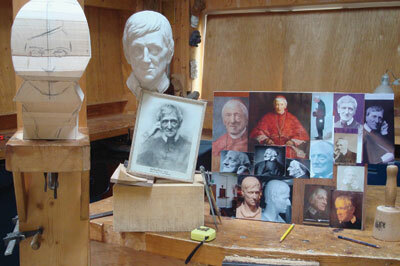 Time and time again I see instructions given to students and part-time carvers to bandsaw all four sides of a piece. You may feel that you've achieved a lot by cutting all four sides, but errors cannot then be rectified. This can only lead to disaster and is not the traditional route. 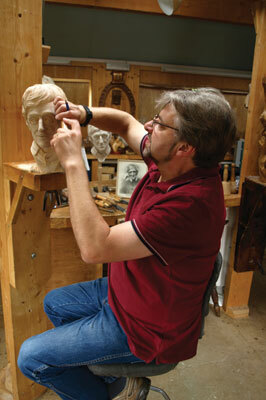 When carving a head, whether a portrait or other - do not cut behind the jaw line, inside or behind the ears, inside the nostrils or behind the lobe of the nostril and, of course, never behind the head itself. Only cut behind these features when you are totally satisfied with the front view. A situation where this procedure is only partly applied is when the work you are undertaking is fixed, or part of a solid background - against a wall for example. The most difficult being the corpus to a crucifix. Here the figure traditionally has its back, shoulders, hands and heels against the cross, so these features need to be set and worked from the back to the front. This creates incredible difficulty in executing the work correctly, especially with the crossed feet. Other features like the head, which has extra wood behind it, may still be approached in the traditional way. In the case of relief carvings where the carved features are integral to the background, allow an extra thickness of timber to provide a greater depth if adjustments are needed. Again, if the depth of timber for the relief is restricted - as it may be part of a larger design - this can be demanding. The question everybody asks is "how long did it take to carve?" Including the research, creating the plasticine model, carving the bust and inscriptions and not forgetting site visits, the total was 170 hours. I hope this has helped and with any luck, not hindered; you can always ignore some or all of my utterings! But, whatever you do; make sure you continue carving and keep enjoying it too. Mike Painter specialised in traditional wood and stone carving for over 28 years â€“ starting as an apprentice and becoming a Master Carver. Since 2003 he is been balancing commissioned work with private teaching. To see more of his work, visit his website.